Festivals in ancient Greece and Rome were important periods of time during which people performed “activities that are most often thought of as communications with the superhuman world.” Marked by a variety of unique cultural rituals and traditions, festival days stood in stark contrast to ordinary life in ancient Greece and Rome. Processions, sacrifices, athletic events, and musical performances were just the start of some of the interesting highlights. The ways in which the ancient people chose to express themselves on these special calendar days is fascinating. In examining both its contrasts and similarities to today, studying ancient culture can be seen as the study of our own humanity. To demonstrate some of the unique aspects of culture in ancient Greece and Rome, we compiled a list of these 9 facts about some festivals in ancient Greece and Rome. 1. To celebrate the goddess Bendis, Thracians in Athens held night-time torch races on horseback. Referenced in Plato’s Republic, these races were quite popular around the time of Socrates in the late 5th century BCE. “Red-Figure Chous with Eros,” circa 410 BC. Public Domain via Wikimedia Commons. 3. Anthesteria, a festival of Dionysus, was of an importance comparable perhaps to modern Christmas. Despite its name suggesting anthos (meaning flower), Anthesteria was associated particularly with the production of new wine. It was celebrated in the correspondingly named month Anthesterion, roughly late February. On the evening of the first day, ‘Jar-opening’ (Pithoigia), pithoi of the previous autumn’s vintage were taken to the sanctuary of Dionysus in the Marshes, opened, offered to the god, and sampled. 4. During Anthesteria, a strange major ritual was held. 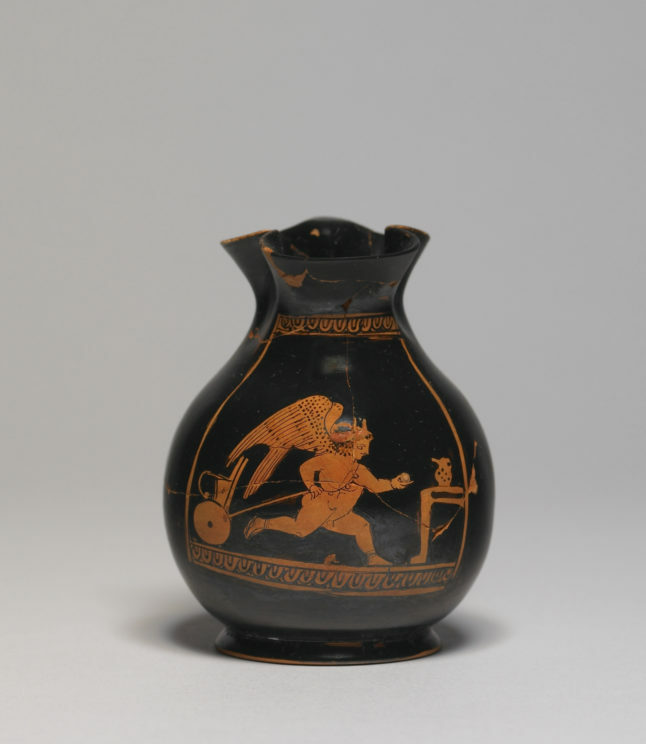 On the day of Choes, ancient Greek for “pitchers,” participants would sit alone and drink a chousor (about three liters of wine) that they emptied without speaking. Social boundaries collapsed as slaves took part. “Miniature choes were also given as toys to children.” Receiving the ‘first Choes’ was a landmark occasion. 5. Also on the day of Choes, Athenians would smear black pitch on their house doors and chew backthorn leaves to ward off evil. 6. For unknown reasons, Romans were very reluctant to have one festival immediately following another, so they introduced an empty “buffer day” between festivals following one another. 7. During the festival of Bona Dea, men (including even male dogs and statues) were specifically excluded from the celebration. At the beginning of December, Roman matronae celebrated the festival by acting as sacrificers and consuming large quantities of wine. The exclusion of men and the radical inversion of upper class female behavior fit into the rituals of the last month of the year, experimenting with social boundaries, and proposing alternative–albeit temporary–models of behavior. 8. The Saturnalia were the merriest festival of the year, ‘the best of days’ (Catull. 14. 15). Presents were exchanged, particularly wax candles and Sigillaria, and as a general rule, Romans at this time inverted their normal behavior. Slaves were either served by their masters or dined with them, and were allowed temporary liberty to do as they liked. 9. During the drawn-out, boisterous carnival of Saturnalia, people enjoyed relaxed meals at home, painted their faces black as if they were wearing a mask, replaced the formal white toga with an informal dress and felt cap (which was proper to slaves), and played with the otherwise prohibited dice. Featured image credit: “Ave, Caesar! Io, Saturnalia!” Sir Lawrence Alma-Tadema, 1880. Public Domain via Wikimedia Commons. Article originally posted on Oxford University Press Blog; reposted with permission.